My study of the significance of music has been slowly progressing since the early sixties 1,2,3, as a by-product of my psychotherapeutic work, particularly in a therapeutic community 4 viewed as an ethological laboratory. The cliché "music is expressing feelings", though true, always has seemed to me to be a mind-stopper, preventing a broader understanding of the meaning of music. As in a dream, music creates a fantasy world. It elicits in us tedencies towards others, and lets us feel the impact of their tendencies. In other words, music creates interpersonal situations in which we participate, although the narrative is only schematic and does not describe any concrete situation. Suppressing the tendency to speculate-not unknown in the field of esthetics- I designed a simple experiment to test the hypothesis that music has interpersonal meaning, which is basically the same for different people. A military march played to soldiers going to war is designed to support their optimistic attitude of self-confidence, dominance, pride, showing off and aggression. Such music makes us to identify with its tendencies. The result could be quite different if these tendencies would be presented iinstead visually, in posters -- such as pictures of aggressive men who shoot. Rather than identifying, we would likely have a complementary reaction -- being pushed into submission, feeling attacked, feeling fear and running away. The same happens when we hear such music in sleep: we usually do not identify with it, we feel the dominant and aggressive impact which pushes us into complementary reactions of submission, avoidance, fear and flight. In a waking state, music can create both identification and complementation -- but most of the time it creates identification. In the first experiments, Leary's 5 circumplex with its eight tendencies was used. But soon, listening to music and ibeing nspired by ethology (e.g., I missed flight, fear), I changed it. 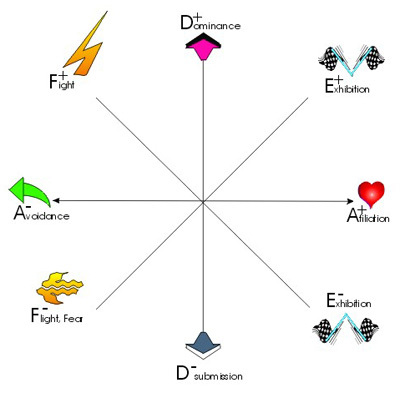 The circumplex (Table and Picture) has a horizontal (afiliation-avoidance) and a vertical (dominance-submission) axes. E+ EXHIBITION+ : Displaying a supposedly valuable quality: I am powerful, attractive, intelligent, have high status, etc. Since the hypothesis tested deals exclusively with the question of the interpersonal meaning of music, questions about the psychometric properties of the circumplex are not important here (such as: Is it psychomentrically well ordered? -- as, e.g., J. Wiggins 6 tries to achieve -- or the question: Is the basic idea of interpersonal circumplex psychometrically sound?, raised by J.D. Jackson 7 "the circumplex structuring is too simple...inconsistent with much of modern measurement theory" )). Two tests were used, consisting of 24 and 17 fragments respectively of European music from the seventeenth to the twentieth centurcies. They were presented to the ESs who independently answered which tendency or tendencies they found in each fragment. In the first experriment there were 3 ESs, in the second 59 and in the third 3 again. In the statistical evaluation the null hypothesis ("the answers are random") was rejected on 5% level of confidence in the first and on 1% level of confidence in the second and third experiment. Numerous subsequent unpublished experiments both from Europe and North America showed the same results. The same has been reported by others (e.g., the musicologist J .Doubravova, 8 .). It is concluded that in the populations studied, music has basically the same interpersonal meaning for all people. What gives the music its universal meaning? One part of the agreement about music among listeners is, no doubt, cultural. If one hears organ music, one thinks about church, something sacred or religious-but only in certain cultures of the world! On the other hand, some aspects of music seem to ne universal. Nobody will think about lovers in moonlight or a sleeping baby when hearing the loud and quick beats of drums or sounds of loud trumpets. Some sound patterns, such as laughter, crying, male and female voice, are believed to be evolutionary programmed social releasers (Lorenz) and are imitated in music by different instruments (flute, violin, violincello, etc. ), possibly as supernormal stimuli. Supernormal stimuli (K.Lorenz 9) are artificial stimuli which have greater impact as social releasers than natural stimuli. (E.g., an artifical egg four times larger, but with a clearer black-and-white pattern than the real eggs of the bird ring plover is preferred by the parent bird, which throws out of the nest its own eggs in favor of the artificial eggs.- A gape of the parasitic cuckoo nestling has a hi gher stimulus value for the parent birds than of their own nestlings.) Music has in some respects similar complex structure as language -- possibly sharing with it its "deep structure" (Chomsky).. The interpersonal character of music is, of course, not the only important aspect of music. Though this will be likely different in future, the present, rather simplified interpersonal analysis is not in a position to contribute to the assessement of the esthetic quality of music. Also, the interpersonal reactions of people of different cultures have to be studied much more extensively than has been possible so far. However, the method can be used already now for studying objectively, e.g., how the musical interpersonal spectrum of a composer changes during his/her life, and how the spectra of different composers and of different musical epochs differ. Also the difference between poetry and music can be studied. For example, there is a discrepancy in renaissance madrigasls, e.g., those of Orlando di Lasso, between the text expressing strongly E-("I am desperate and suffering), and the lack of E- in the accompanying music. And only three decades later, the E- tendency is strongly expressed both in the text and music in the madrigals of Carlo Gesualdo, that passionate partisan of chromaticism and jealous killer of his wife. What would Nietzsche say today?
" I, Zarathustra, descended from my mountain because I love people, that rope between the ape and overman. I am with people all the time -- whether they are real or my phantoms. We are connected -- indirectly by the illusive bridges of words, and directly by music, dance and laughter. What is it that my whole body expects from music? Its own ease: as if all animal functions in me and my friends- love, anger, pride , sadness- were quickened, and I could reach the essence of people as never before. Music makes me slip into the dramas and tragedies of others' lives -- and for a while I am even seduced into believing that these concrete scenes reveal the meaning of music. But that is how music teases me. The scenes are only illusions, reflections on water. The paradox of music is that it is a universal language -- and yet, the universality is not an empty universality of abstraction. Music talks directly to my senses and my body and reveals the true nature of human beings." Interpersonal analysis of music may bring us not only closer to the understanding of music and arts, but also to the understanding of the depths of human nature. 1 Knobloch,F& Postolka M & Srnec, J (1964). Musical experience as interpersonal process. PSYCHIATRY: J. for the study of interpersonal processes, 27:4, 259-265. 2 Knobloch et al (1968). On an interpersonal hypothesis in the semiotic of music. Kybernetika, Prague, 4:4, 364-382.-Experiencia musical como processo interpersonal. Una contribucion a la teoria de la musica. In:Rojas-Bermudes JG(Ed. ), Cuadernos de Psicoterapia. Buenos Aires: Associacion Argentina de Psicodrama y Psicoterapia de Grupo. VII:1-2, 1972-3. 3 Knobloch, F. (1998). Musical experience as interpersonal process: Revisited. In: R. Monelle (ed.) Musica significans (Proceedings of the International Congress on Musical signification, Edinburgh, 1992). Contemporary Music Review 17. 2: 59-72. 4 Knobloch F. & Knobloch J. (1979). Integrated Psychotherapy. New York: Jason Aronson. - Stuttgart: F. Enke, 1983 (German) -- Tokyo: Seiwa Shoten 1984 (Japanese) -- Praha:Grada, 1993(Czech) -- Shantou University, 1998 (Chinese). 5 Leary T. (1957).Interpersonal diagnosis of personality. New York: The Ronald Press. 6 Wiggins J & Pincus AL.(1992). Personality structure and assessement. Annual Review of Psychology, 43, 437-504. 7 Jackson DN & Helmes E.(1979). Personality structure and the circumplex. J. Personality and Social Psychology, 37: 12, 2278-2285. 8 Doubravova J.(1972). Alban Berg's violin concerto from an interpersonal point of view (In Czech). Hudebni veda, Praha, 9(2), 107-139. 9 Lorenz K.(1981). The foundations of ethology. New York: Springer,.